Akerson: "If you look out five years, I would be disappointed if we couldn't get to profitability (in Europe)." CHICAGO (Bloomberg) -- General Motors is worried that Europe's economic weakness will affect the second half of 2012, CEO Dan Akerson said. 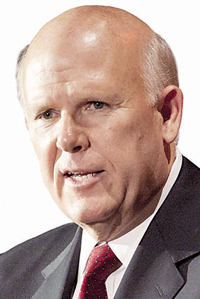 "You can see softness in Europe," Akerson told an audience at the Executives' Club of Chicago. "If there were a meltdown in the euro, which I don't think there will be, I think it would be pretty impactful on, certainly, the United States" and China, he added. Akerson, who oversaw GM regaining its title of world's largest automaker last year and posting a record full-year profit of $9.19 billion, is pushing the company to boost operating margins and fix its European operations, which have lost $16.4 billion since 1999. GM has reported plans to improve its European results, including proposing to close a factory in Bochum, Germany, by the end of 2016, and forming an alliance with PSA/Peugeot-Citroen to cooperate on purchasing and vehicle development. The automaker is in talks with Germany unions about the plant shutdown and delaying pay increases. "It's tough in Europe," Akerson said. "I think we'll be rewarded." The executive told reporters after the event that GM's business plan that runs through 2016 gives the company a "good shot" at profitability. The plan was formally approved today by the supervisory board of its Opel unit. "If you look out five years, I would be disappointed if we couldn't get to profitability," he said. Akerson also cut his sales forecast for the Chevrolet Volt plug-in hybrid car. Volt sales this year aren't on pace to meet Akerson's goal of 60,000 globally this year, of which 45,000 would be delivered in the U.S. Through May, GM has sold 7,057 Volts in the U.S., according to researcher Autodata Corp.
"I set out a goal both for domestic and export of 60,000," he said. "We'll probably hit somewhere between" 35,000 and 40,000 this year. He again said that politics have affected Volt sales. GM reorganized under a U.S.-backed bankruptcy in 2009, which has been criticized by Republicans, including Mitt Romney, the party's presumed presidential nominee. The U.S. holds a 32 percent stake in the automaker. "This car has got a unique technology that I think could be key to a portfolio solution that brings us better mileage on a fleet basis," Akerson said. Akerson also talked to the audience about GM's efforts to change the company's corporate culture. "You need to buy in or get out," Akerson said of employees. "It sounds harsh. I like all of the discussion in the huddle but when the huddle breaks, you run the play. And if you can't then you ought to go work for" Ford Motor Co.